All the trimmings for an exquisitely designed Christmas Gift Basket perfect for office gifting and large family gatherings. 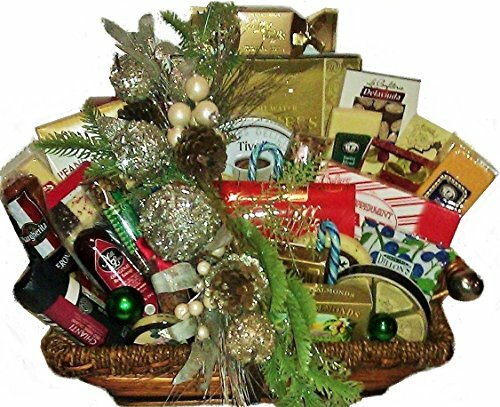 This is a huge basket with all the trimmings for an exquisitely designed Christmas Gift Basket perfect for office gifting and large family gatherings. Featuring Pepperoni, Salami, Beef Summer Sausage, 6 gourmet cheese varieties, deluxe nuts, fine chocolates, deluxe mixed nuts, dried fruit medley, gourmet cookies in tin, fudge, pecan rolls, Belgian Chocolates, chocolate covered nuts, biscuits, dips and so much more. Always hand made with the freshest and finest in gourmet ingredients. Sartori Reserve Black Pepper BellaVitano Cheese Wheel, 20 Pound -- 1 each.